Baby Winnie now has a sister. 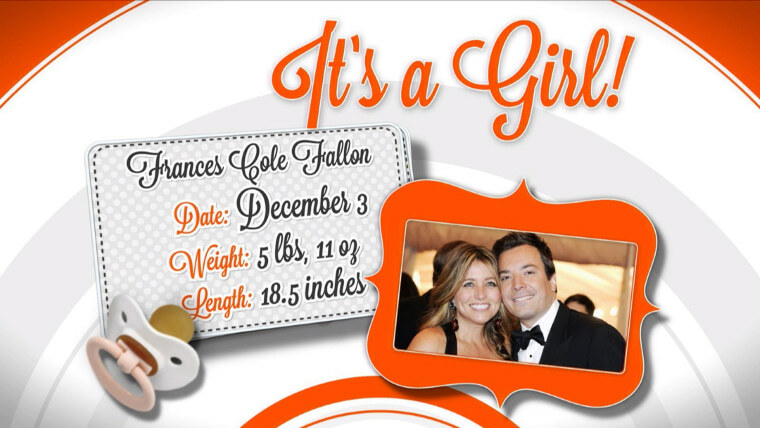 "Tonight Show" host Jimmy Fallon and wife Nancy welcomed a second daughter on Dec. 3, People magazine reports. Fallon later thanked fans on behalf of his new arrival — and revealed her nickname in the process. Due to the baby's arrival, NBC announced it will show reruns of the "Tonight Show" on Wednesday and Thursday. Winnie was born in July 2013. Last year, Fallon explained on TODAY that she was not named for Winnie the Pooh, but for Lake Winnipesaukee, the New Hampshire location where the couple courted and became engaged. It's been a big year for Fallon, 40. He now has his name in lights on the new "Tonight Show" marquee in New York, and was named the entertainer of the year by Entertainment Weekly magazine.